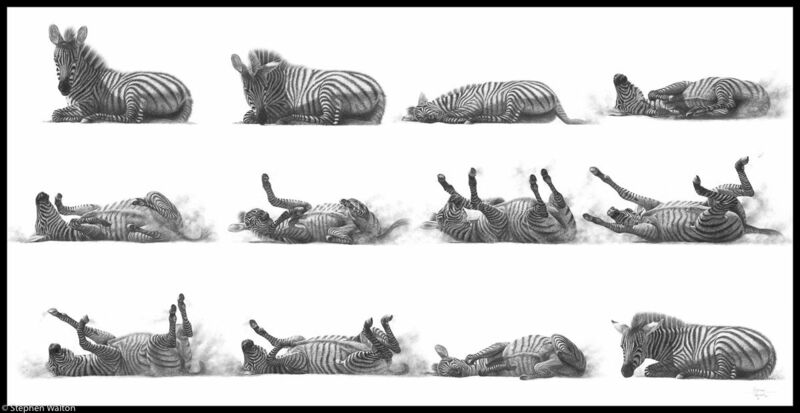 The moment I saw this young zebra rolling in the dust in Lake Nakuru National Park, Kenya, I pictured this drawing in my head. I even decided on its title at that moment. I took 33 photos whilst it was rolling and chose 12 for the drawing I thought gave the most complete narrative. Of all my drawings this is my most successful, in both idea and execution. I enjoyed it so much I revisited it again several years later using pastels and reducing it to 9 zebra.